Dr. S. Carver Davenport, director of music, led the Mount Zion Sanctuary Choir through the worship service which featured Rev. Sonya R. Lars (pastor of Mt. Zion) and Katie Bell as soloists. Prior to the service, the Praise Team, led by Andrea Jackson and assisted by Katie Bell on the saxophone, performed for the first time. 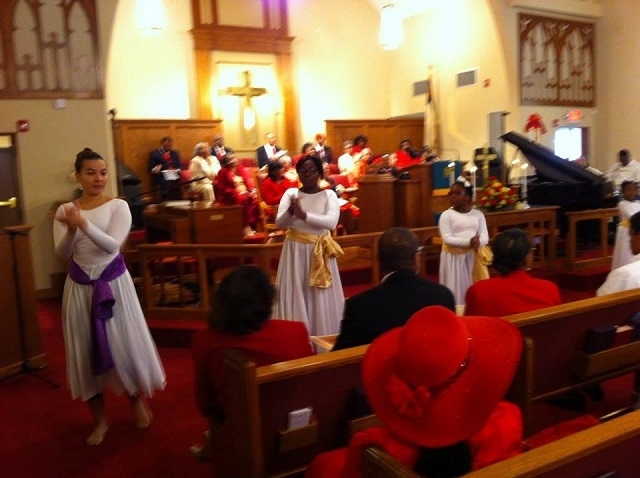 Adonais’ Footsteps, the liturgical dance team led by Kristine Wilson, was featured. Church members remarked on a wall display of fish which represent individual “anniversary” gifts given by members and friends. Representing donations as small as $5, and as much as $500, the financial offerings will help with church operations. Mt. Zion is approaching their $20,000 goal with the campaign. Mount Zion UMC, 2700 Louisiana Avenue, holds Sunday worship at 9 a.m. with Children’s Church (PB&J) running concurrently; STARs exercise class is at 5 p.m. on Tuesdays; Bible Study is on Wednesday nights at 6 p.m. in the Fellowship Hall.